Museums are often accompanied by signs reading, “Do not touch,” “No photography,” “No sitting or standing on sculpture,” and others of the sort. At the Minnesota Children’s Museum, these signs are replaced by one necessary rule to follow: have fun. The Minnesota Children’s Museum, founded in 1981 with its original location in downtown Minneapolis, was built on the philosophy that absolutely nothing in the museum would be accompanied by a “Do not touch” sign. Since the St. Paul location was built in 1995, the first renovation took place in 2017 when more play space was added to the front of the building, expanding the building from 65,000 to 74,000 square feet. 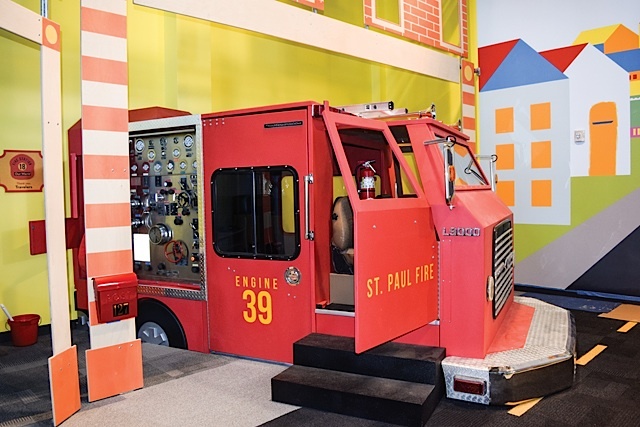 Located in downtown St. Paul, the Minnesota Children’s Museum is easily accessible via the World Trade Center ramp by car or from the 10th Street Station by Green Line. 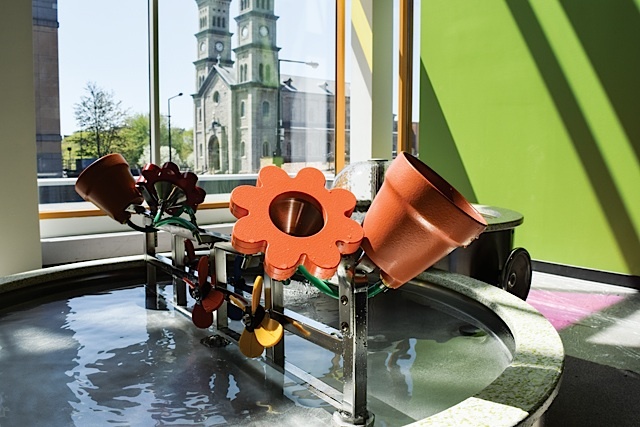 This summer is a perfect time to visit the newly reopened Minnesota Children’s Museum as it now features 10 all-new exhibits that appeal to children from infants to teenagers. “Most of the exhibits have special areas we call Tot Spots, which are especially appealing to younger children,” says Sara Kerr, Director of Content and Communications. Some of these new exhibits include The Scramble, a four-story climbing adventure with a two-story slide; The Studio, a space with real tools and authentic materials where visitors can create things; and Super Awesome Adventure, which includes a green-screen climbing wall, laser maze, and carpet skate park. Additionally, there are two outdoor galleries that are open seasonally. The Minnesota Children’s Museum appeals to children of all ages, adults included, for many reasons. Families frequently report that they feel there is always something for everyone at the museum. 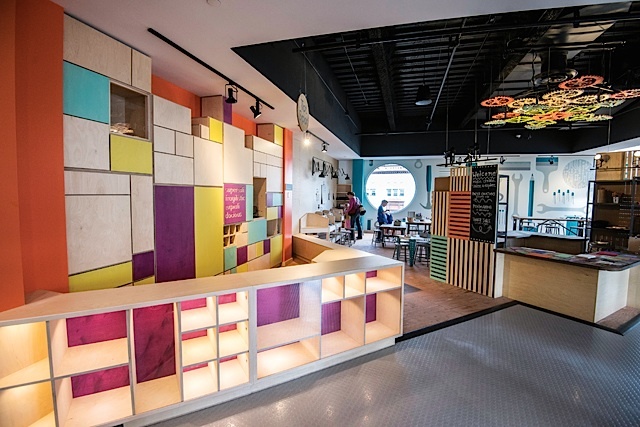 Since its renovations, the Minnesota Children’s Museum features a more open floor plan with improved sight lines, twice as many bathrooms including gender neutral ones, and a cafe with a coffee bar and more seating. “Honestly, it’s the fantastic exhibits that really wow the kids and adults. We often hear young voices complaining they don’t want to leave,” says Kerr. Involved in several events including Rondo Days, Cinco de Mayo, and Little Mekong Night Market, the Minnesota Children’s Museum is an active participant in the community, including the GLBT community. “The new museum is designed to delight adults as well as provide playful learning experiences for children. We took special care to take into account the needs of adults: spaces that are comfortable for adults and children, adult-sized costumes in the galleries, graphics that include humor and a nod to nostalgia, and play experiences that adults also find fun. Plus, we truly believe that ALL children and families deserve a comfortable and inclusive place to relax, have fun, and expand on the creative and critical thinking skills that are essential to life-long learning,” says Senior Exhibit Developer Mary Weiland. The Minnesota Children’s Museum is often appreciated for providing opportunities for fun and learning for everyone from children to adults. “We encourage adults to play, too! 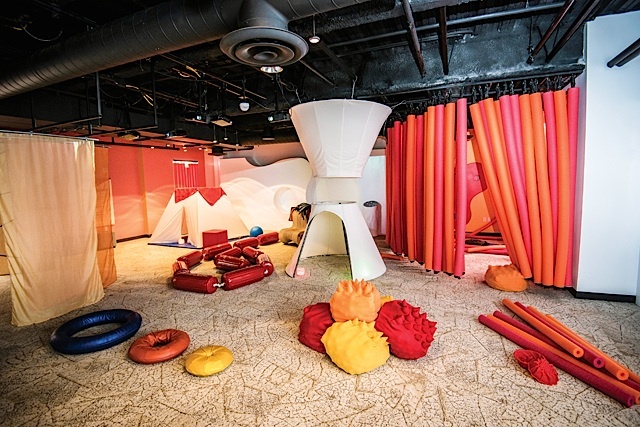 There are plenty of resting places if you just want to sit back and relax and watch where children’s imaginations take them, but you’re also totally welcome to crawl through The Scramble (as long as you brought your socks! ), hold an imaginary tea party in Our World, experiment with air and water in Forces at Play, put together a sticker mural in Creativity Jam, build your own project side-by-side with the kids you brought at The Studio, and more. You can also scaffold kids’ learning by observing what they’re doing, asking open-ended questions, and posing challenges like, “That ping-pong ball went really high! It bounced off the ceiling and through the construction cone sculpture. What other directions can you send the ball? What happens if we add another pipe to the launcher? How is it doing that? How big can we make the launcher? How fast can we make the ball go?” says Gabby Santiago, Experience Supervisor/Museum Experience Lead. Both Weiland and Santiago are members of the GLBT community and share their enjoyment both in working at the Minnesota Children’s Museum and participating in the exhibits, too. “It’s a really joyful place. We work here because we love kids, playing, and learning. We can’t wait to see the great discoveries our visitors make about themselves as they try new things for the very first time, whether that be going down a 17-foot slide, making a stop-motion video, pretending to drive a fire truck, or tasting a basil leaf out on the Tip-Top Terrace. We want you to leave the museum feeling like the world just got a little more open and a little brighter,” Santiago says. While the museum provides a different learning experience for each individual child, there is one thing that remains constant from person to person: you are bound to have fun. 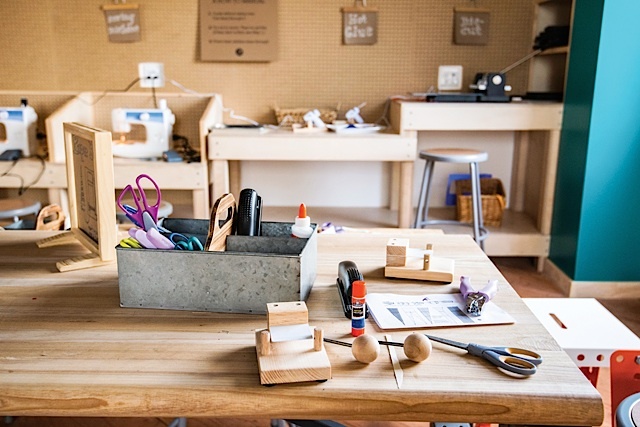 “Every kid is different, and we definitely have ambitious four-year olds trying out sewing machines in The Studio and nostalgic 17-year olds happily playing house in Our World every day. But in general, older kids enjoy the challenges posed by The Scramble, The Studio, and Forces at Play. Our new ‘3 and under’ gallery Sprouts has its own water table, climbing structure, slide, and other features that echo other exhibits so groups with only small children can still have a full museum experience in a space just for them,” says Santiago. She says that some of her favorite exhibits include Creativity Jam and Imaginopolis because of the ease with which you can scale up or scale down the experience. Some kids build elaborate structures or enact epic stories, and others simply explore the materials. “All of those kinds of play are valid and great and beautiful,” she says. Entry fees to the Minnesota Children’s Museum are $12.95 for anyone between the ages of 1 and 101, and anyone under 1 or over 101 can get in for free. Also, parking is $5 for three hours in the connected World Trade Center ramp. Memberships are very popular among visitors because of the convenience and low price. “Memberships are two named adults of any gender and all the kids who live in their household and, depending on the level of the membership, may include up to two free guests each visit. So if your niece/nephew/sibling is named on a membership, be sure to check before your visit what kind of membership they have and whether it includes one free flex member each time (Deluxe), two free flex members each time (Premier), or no free flex members but a $2 discount on up to six people (all memberships, including All Play which is our free membership for families whose household income is below a certain level, Passport, and after the flex members have been used, Deluxe and Premier),” says Santiago. Whether you’re 2, 22, or 82, the Minnesota Children’s Museum will surely have something that will interest you. 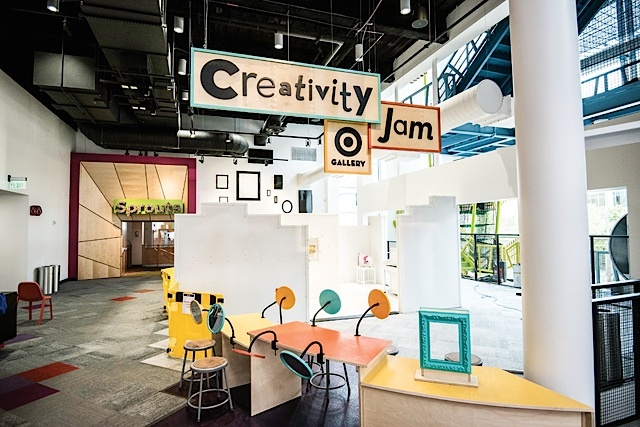 Opportunities to play, learn, and expand your ideas are offered every day at the friendly, inclusive, and diverse community that makes up the Minnesota Children’s Museum. Bring your kids, your nieces and nephews or your significant other, and experience the sweet joy of being a kid again.